A new study published in Circulation suggests that eating a southern-style diet that is rich in fried food, organ meats, and sugary beverages may increase the risk of coronary heart disease. Researchers analyzed the dietary habits of more than 17,000 Caucasian and African-American adults aged 45 and up and compared that data to data gathered from the REasons for Geographic and Racial Differences in Stroke (REGARDS) study. For the study, participants were enrolled between 2003 and 2007. Each participant was screened by telephone before going through a physical exam and completing a questionnaire that outlined their food consumption over the previous year. Participants were followed up with every six months and were questioned about their current health status. The follow-up period continued for six years. Based on the types of foods each participant consumed, researchers grouped them into five dietary patterns: convenience, plant-based, sweets, alcohol/salads, and southern/fried foods. Results indicated that participants who ate foods from the southern dietary pattern increased the risk of a coronary heart disease by 56% compared to those who consumed these types of foods less frequently. 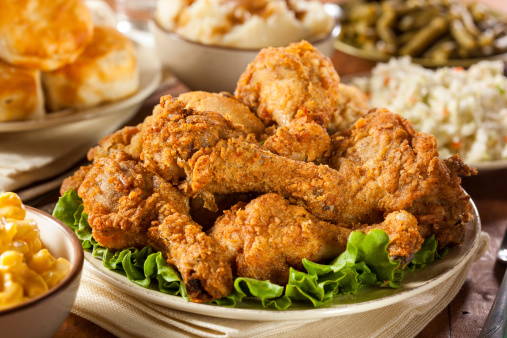 McIntosh, J., “Southern-style diet could increase risk of heart disease,” Medical News Today web site, August 11, 2015; http://www.medicalnewstoday.com/articles/297950.php.